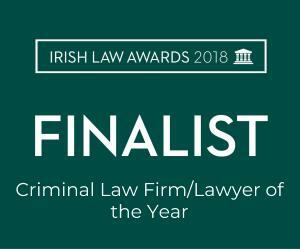 The team at Michael J. Staines & Company were delighted to learn that we have been shortlisted for Criminal Law Firm of the Year at the prestigious Irish Law Awards 2018. The firm has been shortlisted every year since the inception of the Law Awards and won the award in 2012, 2014 and 2017. This year's shortlisting is testament to the depth of skill, talent and experience within the firm as well as to the provision of a service of excellence which is fitting to our profession. Our second nomination is for Dublin Solicitor of the Year where Aoife Corridan has been shortlisted in respect of her work on what was the longest running trial in the history of the State - DPP v Sean FitzPatrick, the former Chairman and Chief Executive of Anglo Irish Bank. The Irish Law Awards take place on 11th May 2018.